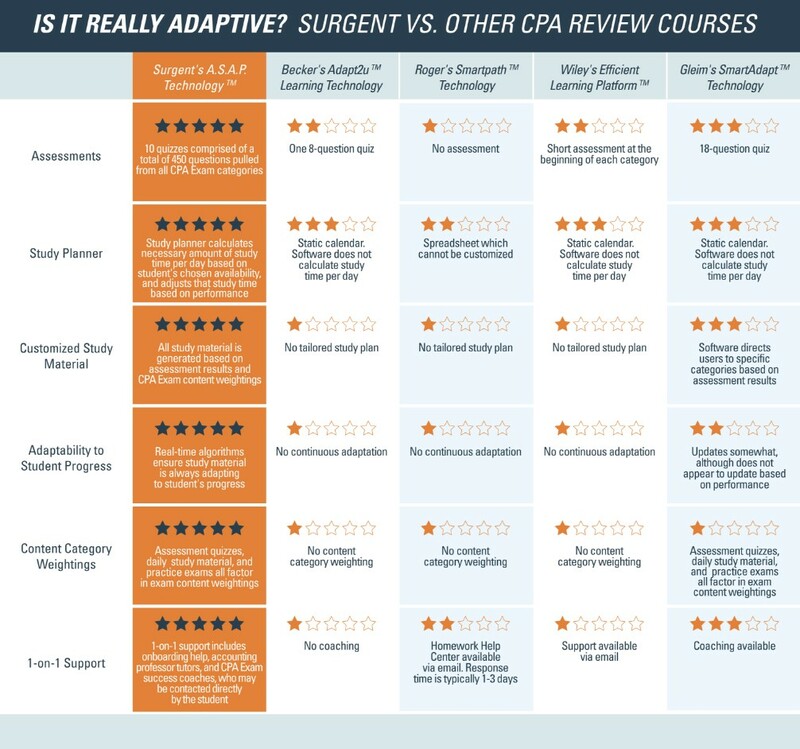 Surgent CPA Review is one of the newest CPA Review courses on the market, though it comes from a long-time leader in accounting education (and its instructors are among the most experienced and highest praised). The course features a proprietary “adaptive learning technology” (known as “A.S.A.P. Technology”) that assesses students’ knowledge and then focuses them on specific content areas, thereby drastically decreasing the study time, while still boasting a pass rate that’s 2x the national average. To accomodate students of all skill levels, schedules, and budgets, Surgent offers three different tiers of membership to their training programs through three different “Pass” programs you can sign up for. These passes include Premier, a well-rounded option offering physical study materials, a scaled-down Essentials pass that offers the core of each program, and the all-inclusive Ultimate pass that provides additional hands-on education and training courses focusing on specific software. By offering different levels of access to their programs, Surgent offers approaches and course levels that can meet the needs of nearly any student, even if the costs can start to add up across the various levels. ReadySCORE™ provides students with real time comprehension scoring for each content section that correlates directly with exam readiness. 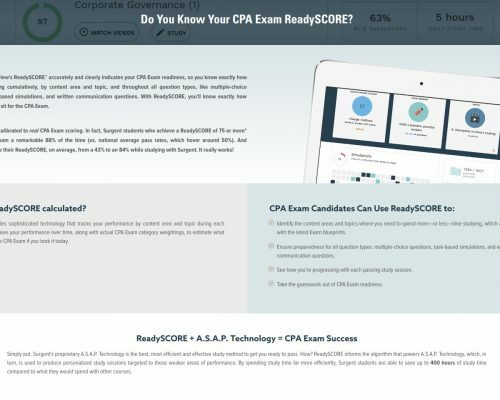 Know where you stand before you take the CPA exam. Identify those content areas and topics that are your strengths or weaknesses, includes all types of possible questions: multiple choice, simulation and written communications. 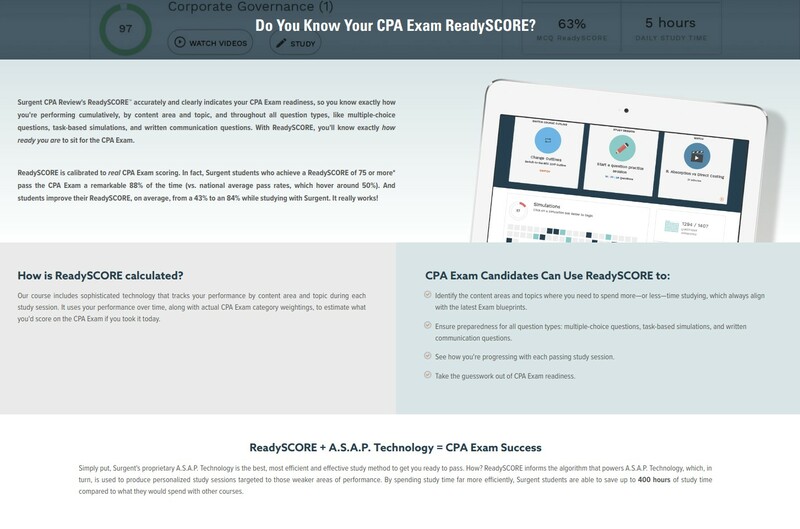 On average, a student’s combined ReadySCORE at the time he or she sits for the exam is within 4% of his or her actual CPA Exam score. 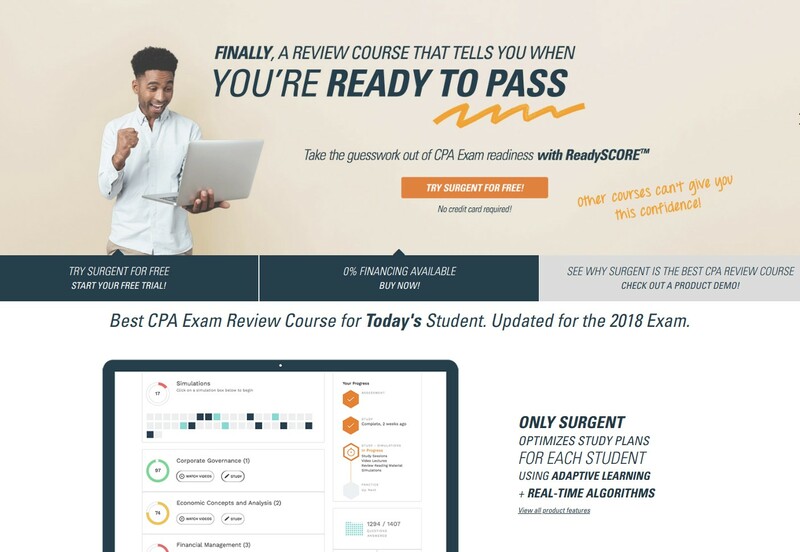 Though Surgent’s adaptive approach helps students avoid having to watch all of their videos and work all of their questions and simulations, the course content is extremely comprehensive, they stay on top of CPA Exam changes (they were the first to incorporate DRS questions into their content, for example), and their very strong instructors make even complex topics easy to understand. 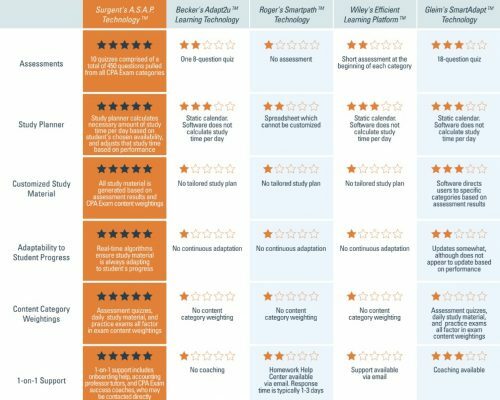 In addition, Surgent offers a 5 day free trial, allows unlimited course access (including updates) until you pass the exam, a pass-or-refund guarantee, and the most student-friendly payment plan available. 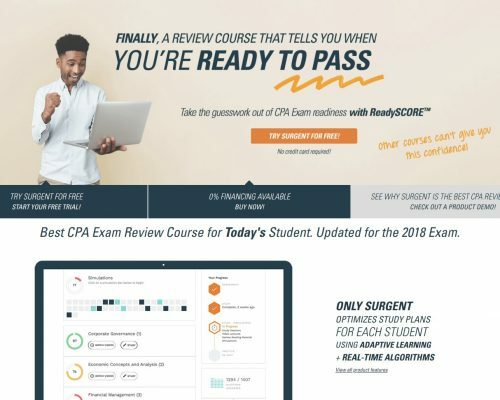 Though you won’t have to go through nearly all of it, given Surgent’s adaptive technology, the course includes over 6,840 multiple-choice questions and nearly 400 task-based simulations, including previously released AICPA CPA Exam questions (along with thorough explanations). In addition, the platform features over 350 video lectures, most in 10-20 minute sessions to increase material retention. The Surgent CPA Review course includes up-to-date information on all four parts of the CPA Exam—including the new DRS question types. Surgent’s interactive user dashboard is built with an adaptive learning software which assesses your strengths, and identifies any weaker areas. The course creates customized study plans that focus you on the specific content you need to learn (while enabling you to skip 100 or more hours of study time per section). A helpful feature of the dashboard: It tells you when you’re ready to sit for an Exam Section based on your performance to-date. Featuring instructors who have 30+ years of experience, Surgent students will have access to CPA Exam specialists who have “been there and done it” before. The team boasts a response time on questions of less than five hours, giving students quick access to exam experts to discuss study tips, tricks, and personalized recommendations. Surgent CPA Review provides support until you pass the CPA Exam. When there are changes to the exam, the course is continually updated with the latest content. The Surgent course dashboard will is updated at no additional charge to you. In addition, Surgent offers no-interest payment plans and a total cost that is among the most affordable of the top players in the market.